A couple months ago I realized I really need an office of my own. I’ve been working in an office/study/playroom in the front room of our house and it’s been driving me slowly crazy. I really needed a space of my own, someplace to go to close the door and make conference calls. Someplace besides my closet, where I was working/hiding from the kids while making cross country business calls and silently slamming my bum against the locked door to keep the children out. I love the study, but I’ve outgrown it. So Viktor and I sat down and had a heart to heart, and tried to figure out how to carve some office space out in our home. Turns out, we’ve been sitting on gold. Not literally, although wouldn’t that be nice? But we’ve had this empty, non-purpose room in our basement we’ve never known what to do with. The former owners of our home had made it into a nightmare/craft room and we didn’t think we had it in us to turn it into something usable. 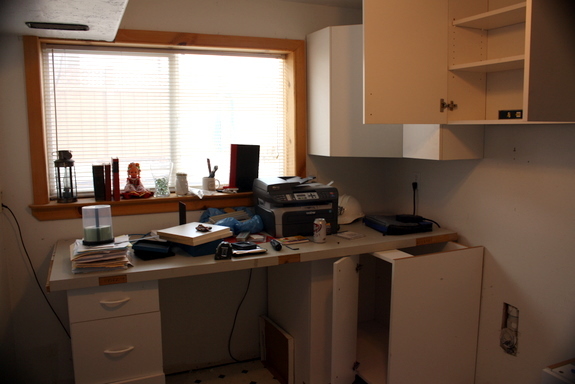 The photo above is the room when we toured the house before we moved in. We didn’t help matters. All our junk accumulated into the depths of horrible and we just shut the door and pretended we didn’t have a basement. 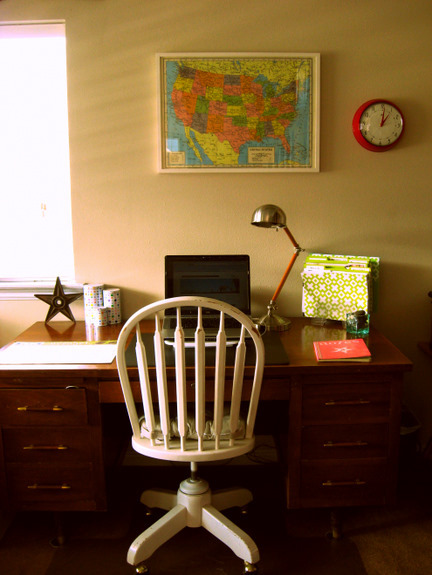 It suited us just fine until we realized I needed an office space, and I needed it right now. So while I was traveling this month, Viktor put his back into it and created an office out of nothing. 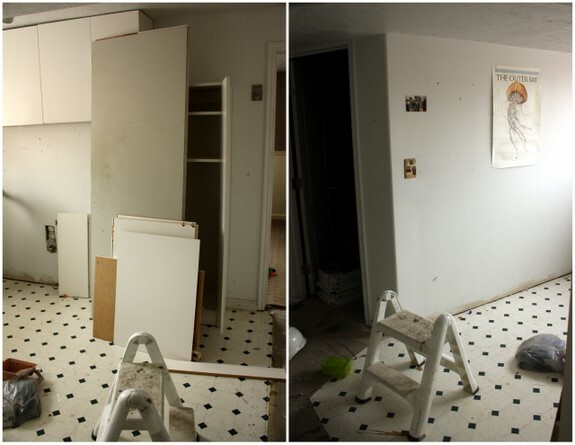 The total cost was well under $1,000 including flooring, furniture, and paint. I decided, as a basement office, I needed it to be bright and cheerful. Someplace I wouldn’t mind spending hours upon hours even in the depths of winter. 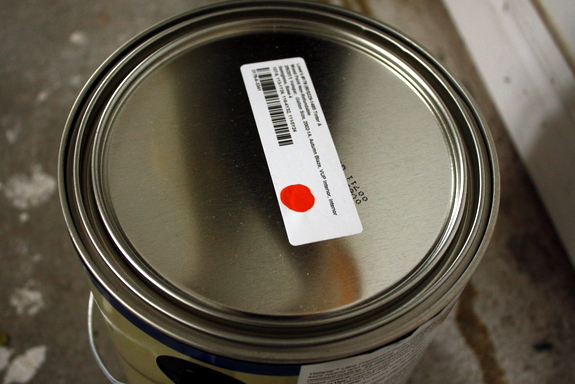 So we bought electric orange paint, the same color a dear friend of mine used in the office remodel of her 18th 19th century house. It was gorgeous in her house. 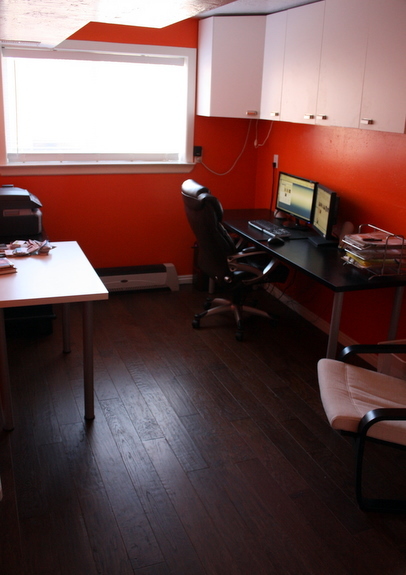 She even painted the ceiling a lighter shade of orange, and I’ve wanted an office like it ever since. These are the stairs leading down to the office. There’s a closed door at the top of the stairs. 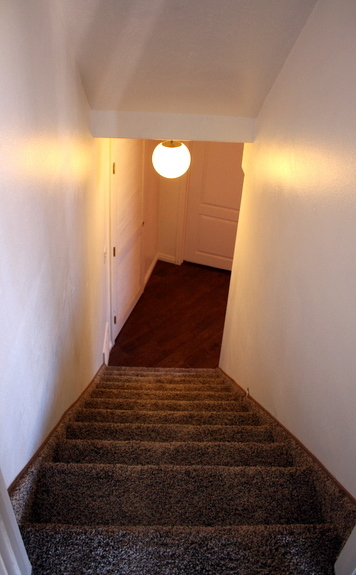 A closed door at the top of the stairs. New carpet on the stairs. That was a surprise, I thought I was going to have to deal with the paint smeared, ruined, 17-year-old, forest green loveliness from the previous owners. But we have new carpet! And it’s beautiful. 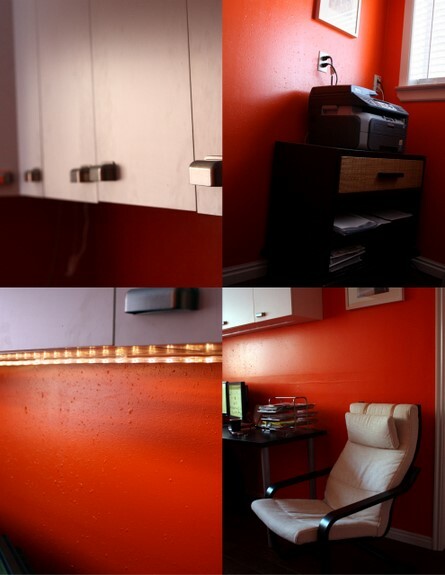 I’m extra excited about the small things, like the track lighting Viktor installed in the cabinets above the desk. New handles on the old craft room cupboards. White baseboards instead of pine. 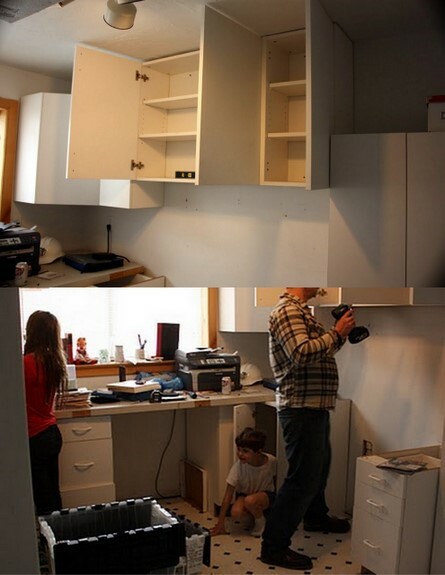 As per my request Viktor raised the cabinets all the way up to the ceiling. It was wasted space, in my opinion. Wasted, dusty space that had previously been filled with fake ivy. My skin crawls a little just thinking about it. I got the This Too Shall Pass print off Etsy from Nan Lawson. It’s one of things my grandmother used to say to me growing up, and do you know what? She was right. Having that framed above my printer makes me feel like she’s with me a little bit, every time I turn around. The clocks were Viktor’s idea. I want to spray paint them silver or something, they look like the cheap plastic they are, but they get the job done. 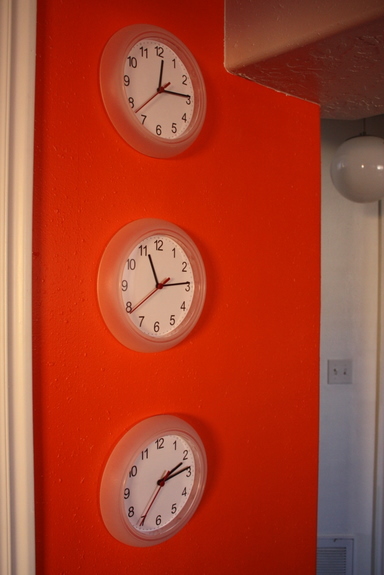 One clock is on Salt Lake City time, one on California time, and another on New York time. I’m usually on conference calls with both the eastern and western seaboard, and it’s more often than not I can’t remember what time zone I’m in, let alone the agency I’m on the phone with. The clocks help. The floor is probably my favorite part though. 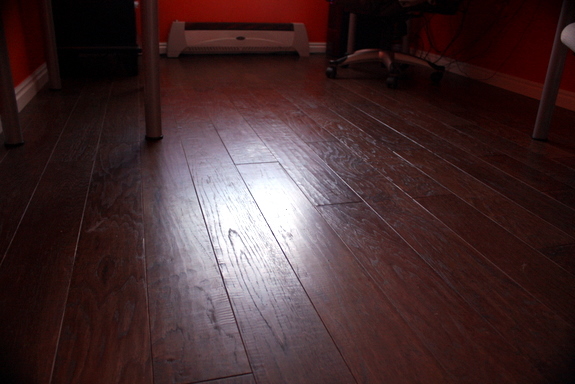 It’s manufactured hardwood we bought from our neighbors who do flooring. I want to get my Petit Elefant logo done in vinyl, maybe above my desk somewhere. I’d like a rug of some sort. I need an inspiration wall/cork-board/homasote board And eventually, the white photo table I use to take photos will have to be moved to another room. But can you believe? Bieber makes me believe. I’m sorry. I really am. It’s been a long couple of months around the Czarnecki household. Longest of my life, maybe. A Justin Bieber quote was bound to make it in there somewhere. I need to spend a lot more time, and a little more money on Etsy decorating the place, but for now I can’t believe my luck. It is awesome. Really awesome. So, so lovely! Viktor is a peach. LOVE LOVE LOVE! space looks great! It’s absolutely lovely and motivating for me to make an office space for myself. I especially love the map and the clocks! It looks great. 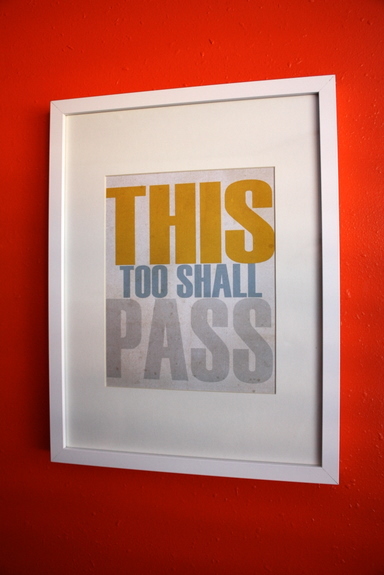 I want to do a whole wall with prints like your ‘this too shall pass’! I already have I already have three…working on more. We did a vinyl of our construction business logo with an established date below it in our work office. My next one is my Funky Vintage Kitchen Logo and est. date! That would be cute under your logo! Love the orange and that your hubby took care of you! Viktor here: I’ve been collecting large paper maps form everywhere we go in hopes of one day wallpapering a wall with the maps and ‘moj poj’,over it. I’ve been outvoted 1 to 1. What a redo! I love before and afters and these are great. Hope you enjoy it. We’re in the process of remodeling a guest bedroom for my office and your post has me motivated to finish it! Oooo. spicy! That’ll energize you for sure. Great color. Lovely! I’m glad you went with a bright color in the basement. 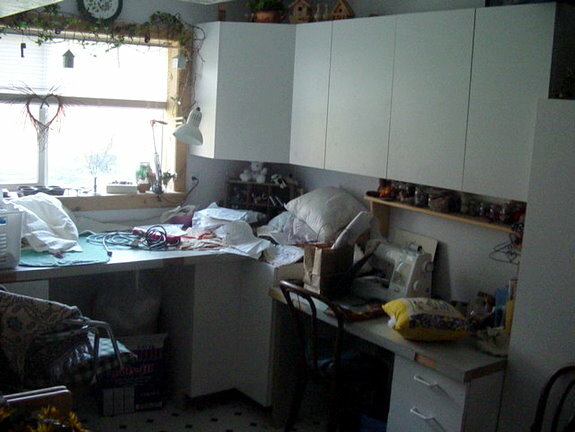 I wholeheartedly agree that space above cupboards is wasted and dusty. It looks fabulous! I love the time zone-friendly clocks and the hardwood flooring. 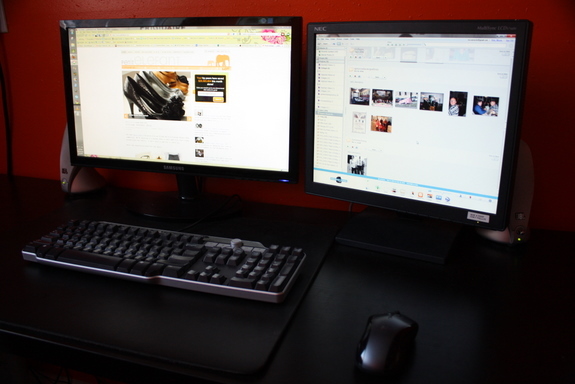 Plus I love you’re a double-monitor gal like me. ;) Also, could you have Viktor post on how husbands can make their spouses’ heart super happy by completing a surprise home project? Thanks. Hooray for your office. Anything to help bring peace & progress. It’s lovely. So happy for you! Wow, what a great space! It looks so new, fresh, modern, and simple. Very nice! Also, I’m jealous that you have such great light in your “basement”! Good for you! We are leading parallel lives, what with the childcare stuff and the need for an office. I have a desk in the play area. With the dollhouse on one side and a shelf of the baby’s books on the other. You can guess how that’s working out for me. Great space. It wonderful to have a dedicated space. My craft/sewing room is part of the laundry but that works well since ya know, have to wash and iron items as I sew and when I need to block or felt knitted items. My walls are bright pansy purple and I luuuuuuuuvvvvvvvv them! Yay for you and big pat on the back for Viktor! It’s beautiful and is sounds like it satisfied a need you really had!! Good for you. Enjoy your new space and I hope it inspires your creativity! Oh this is so lovely Allison! Even more so that your sweetheart did it all for you. What a keeper! It looks truly amazing. I can imagine it’s quite peaceful. I really need to do the same. What a great hubby to do all that for you! I’m a but jealous. Thanks for sharing! That was supposed to be a “bit” jealous, not but. Damn iPod. Lol! What a wonderful gift! Lucky girl. Awesome. Your husband is super handy; he’s a keeper! Congrats! I’m really excited for you. It looks great! Like you i love the floor and what an awesome surprise, the carpet! It looks so great now. What a great room to have to yourself! Totally gorgeous. Grab a sleeping bag and never leave. I love love LOVE IT! There is nothing like having a space to call your own. And a beautiful space, at that! Congratulations on your awesome new office! 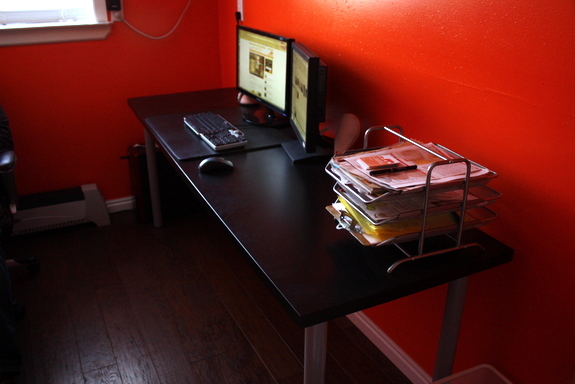 How much do we love hot orange walls and a handy hub (love me an Eastern European with a drill, got one too.) if you haven’t already, do check out theofficestylist.com. It’s my fave source of office decor/design inspiration. I LOVE it! The floor is my favorite part too, but I also love the red! Very pretty! Sanity rules! That room was an office waiting to happen.